Cruises, tours to China Open Ancient Culture to Modern Imagination . There are few travelers who can resist the opportunity to explore ancient ruins, historical sites, or centers of cultural interest when visiting a foreign country. Visitors to China will not be disappointed when booking a cruisetour with Princess Cruises. Their tours, in conjunction with an Orient cruise, cater to travelers who want to enjoy the relaxed feeling of a luxury cruise vacation, but who also want to really experience the pleasure, the mystery and the excitement of stepping into a foreign culture. Princess Cruises offers a spectacular 23-day “Best of China” cruisetour from Bangkok to Beijing on September 20, 2014. 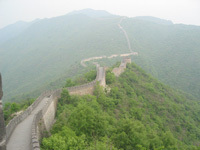 Included is a six-day land tour of China and a 17-day SE Asia/China cruise on the spectacular Diamond Princess. All meals, transportation, tours and hotels are included during the land tour. Shore excursions during the cruise are extra. The cruise is first, followed by the land tour on this date. Famed throughout history as the source of silks and spices, jewels and jade, the Orient is legendary. Think of the Orient and you think of the Forbidden City of Beijing, the international wares of Hong Kong, and the grace and beauty of Japan. Because of its ancient beginnings, the culture and people of China often seem remote and unreachable to American tourists. The Chinese people have had written historical records for over 3,000 years, and their culture extends back even further than that. In sharp contrast to many parts of the United States, where “antique” stores often carry shelves of toys that the store’s patrons remember buying as children, in China one is confronted with artifacts of a culture which has been vital and active since long before the birth of Christ. As you begin your cruise, you'll first enjoy 2 days at sea, where you'll be able to partake of all the many amenities on board the Diamond Princess and rest up after your flight in Bangkok. Your first port stop will be Singapore, a city-state of 4 million people of all cultures. There are many tours to entice you here - perhaps The Botanic Gardens. Spread over 52 hectares, they offer a combination of untouched primary forest and specialty gardens, including the National Orchid Garden. Or the Singapore Zoo - considered among the best in the world, the zoo sits in a rainforest environment. Its "open concept" offers the opportunity to fully experience the animals. Shop and dine on authentic dishes in lively Chinatown after immersing yourself in Hindu culture at the 19th-century Sri Mariamman and Thian Hock Keng Temples, the oldest and most popular in Singapore. After another day at sea, Hong Kong beckons as your ship glides into one of the most legendary ports in the world. You'll have two full days here to explore the narrow streets, busy with the activities of noodle vendors, fortunetellers, hair cutters and bonesetters. An endless array of shops offers everything imaginable. Take a city tour, a harbor cruise, a cultural tour, a tour of Lantau Island and its Po Lin Monastery, and witness a Tai Chi demonstration, followed by a Chinese Tea and Dim Sum Tasting. Or just go shopping! Two more days at sea allows for some ship life and rest, before your arrival into Shanghai, for a full day of sightseeing. You’ll have ample time to visit the Bund, Jade Buddha Temple, Children’s Palaces, Nanjing Road and Jichang Garden. You can take a train ride to Wuxi and the Grand Canal or visit Suzhou and a silk factory; tour the Yu Garden or visit the Shanghai Museum. Next, you’ll visit Nagasaki, Japan - a memorable port, indeed. The Nagasaki Memorial Tour visits Peace Park, where the atomic bomb struck in 1945, killing an estimated 75,000 people. At the Atomic Bomb Museum you can view thousands of photos taken immediately after the explosion and many other displays. Today, however, the city is once again full of life and graced by gentle beauty. Your visit to Glover Garden will take you back in time to the 19th century as you walk among the historic buildings and delightful scenery. The next port is Busan, South Korea. Busan (Pusan) is Korea's second largest city with close to 4 million people. It also serves as the country's main port for international cargo, as well as passenger ferries to Japan and Jeju Island. The city is famous for its seafood and beaches, as well as the Hallyosudo Waterway with its picturesque islands. Enjoy your last day at sea, before arriving into Tianjin, China, disembarking your ship and transfering to Beijing. Enjoy sightseeing to Tiananmen Square and the Forbidden City. Top the day off with a welcome dinner. The next day, enjoy a full-day tour of the city’s famous sights, including lunch. You will visit the Summer Palace with its brightly colored pagodas. Also, the Great Wall, where you’ll have a chance to actually walk on this fascinating landmark from China’s past. From atop its sturdy walls of earth and stone, you’ll have a view of the surrounding countryside and, as you gaze down the length of this incredible 1,500-mile-long structure, realizing that you are viewing only a small portion of it, you’ll gain a new appreciation for the ingenuity of its long-dead architects. What a thrill to explore this amazing piece of history! The Imperial Gardens is also included sightseeing today. Your evening is free. The next day begins with sightseeing at the Temple of Heaven. After lunch, take a tour by rickshaw of ancient Hutongs (alleyways). Then, fly to Xian for the next two nights. The next day, tour the Terra Cotta Warriors. The warriors, grouped in battle formation, are certainly one of the most curious sights you’ll see on your trip. These large statues have been described by archaeologists as “clay clones of a 7,000-man army”. Peasant farmers discovered the warriors in 1974, as they were digging a well approximately one mile east of Emperor Zin Shihuangdi’s burial site. In the morning, tour the Shaanxi Provincial Museum and Big Wild Goose Pagoda. Then you’ll fly to Beijing, and enjoy a Peking Duck dinner at a local restaurant. The next morning, you'll board your flights back home.